A Pannier is a basket, box or container that is attached to the sides of bicycles or motorcycles. 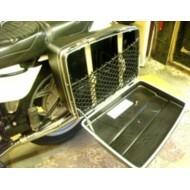 Panniers are usually carried in pairs and are designed to store cycle equipment, motorbike leathers and personal items. At Nets4You we supply a range of made-to-measure elasticated nets, with or without a frame, to fit your pannier. This will allow you to create additional space within the pannier and make it easier to organise your belongings and maximise the limited space available for storage. These high quality elasticated nets allow room for expansion while still allowing items to be held securely in place. The nets are very hard wearing and the nets retain their elasticity, even with continued use. The nets are available with fittings to provide a complete solution which is easy to fit. The nets can be made to fit any hard case including brands such as: Metal Mule, Touratech, Hepco & Becker, TraX, Ard, Givi, BMW, Varios, BMW Adventure Aly, Worldbeaters and many more. 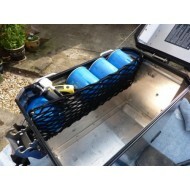 All our nets can be custom made to fit the exact dimensions of your pannier to meet your requirements.